· The CXCC is a really low-key comp, with most days being more like a day of flying with your sky buddies than an organized comp: no launch windows, no task committee, no (pre-determined by a task committee) goal, no start times, no land-by times. · You'll learn how the big dogs pick an optimum task for each day's conditions.. There's a list of waypoints if you want to try a triangle or an out-and-return, or you can just head downwind and see how far you can get. A daily weather briefing provides guidance in choosing a reasonable task. Landing options are plentiful out on the flats. Experienced pilots will offer suggestions for choosing tasks that are doable for a pilot's experience level and the day's weather. · If you are new to XC flying, you will have lots of experienced pilots willing to share their accumulated knowledge about how to get high and go far at Chelan, and how to use your GPS and flight instruments to improve your success at cross-country flying. If you've done some cross-country but want to push your XC skills up a notch, you probably can't find a better venue at a better price for advancing your knowledge and skills: a mere $90 for the six-day event (6/30-7/5) if you sign up by 6/15, $100 after that. Whatever your skill level, you'll be part of a Northwest flying tradition that's been happening for over 30 years. Evening sessions will include panel discussions on tips and techniques for successful Chelan XC flying, as well as informative and entertaining stories from pilots who flew in the early days of the CXCC, or just last year. Some of the original Classic organizers and competitors will be on hand to tell about the olden days when everybody was an XC newbie, setting personal bests and site records on a regular basis. And there's always that bottom line: Your entry helps pay the various use-fees required by the agencies that own the land we launch from and land on. More information is available on the CBCC website, www.cloudbase.org, or contact Lenny Baron, the 2013 meet organizer, at lennybaron@comcast.net. It’s now June and the flying season is upon us and the Chelan dust devils have started spinning! I’m really looking forward to both running and flying in this year’s 32nd annual Chelan Cross Country Classic, June 30th to July 5th. The Classic is not a sanctioned, hard-core meet, nor a frilly spot-landing contest with door prizes…It’s somewhere in between. The meet purpose is to provide vigorous competition for the top pilots, yet a great learning experience for novice X/C pilots, and a great vacation town on the nicest lake in the world for your loved-ones. The meet format is pilot-called task – you decide what to do and how to get the most out of each day. 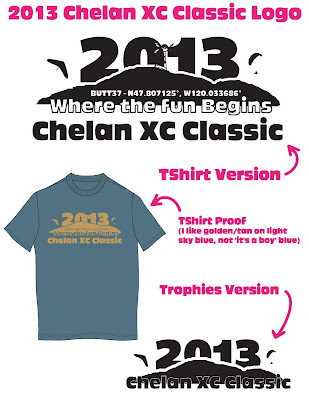 Chelan X/C conditions in July are legendary and with good reason. This is both a hang gliding and a paragliding meet, both wings are welcomed and both wings will have sub classes based on performance differences. Plenty of trophies are up for grabs. The rule updates, along with new waypoints, and special events plans are almost complete. Here’s what’s coming: 1) One called-task day. This will help all pilots along as we all become thermal markers. If a pilot finishes early and wants to keep flying this will be their chance to do a multiple task. 2) New, closer-in waypoints to allow smaller out-and-returns and triangle flights (20-30 milers). 3) New mountain waypoints, added primarily for paragliders. Good for high-pressure weather days 4) An evening panel discussion with Chelan legendary luminaries, X/C tips and “Back in the day” stories 5) All ages dancing at one of the downtown clubs 6) Let’s hike the Butte, early morning exercise 7) And…back by overwhelming demand…the always popular BBQ. Come fly the Classic and join in on this fun. Get high and go far!